Lightweight, strong hold, formula is never stiff or sticky. Takes lasting volume to new heights. A root-lifting spray that adds volume to the hair. Formulated with pure organic bamboo extract and stimulating, phyto-nutrient rich organic maca root, this styling spray takes lasting volume to new heights. Used on dry strands to infuse volume into hair that has fallen flat, it boosts fullness and lift at the roots where you need it most. It features color hold technology for color retention-because great hair should be sustainable. Parabens, sulfates, phthalates free. Directions: Remove safety tab from the top of spray head before 1st use.Shake well before using. 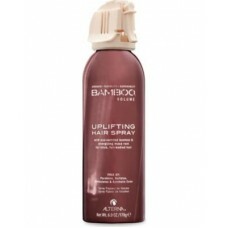 Spray 6-8 inhes away from dry hair to finish your style. Details provided by Alterna. 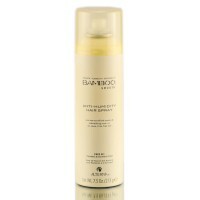 This product recommended by Award Winning Hair Stylist Elena - Figaro Salon Art Director & Principal Stylist.